SPEXER 1000 is a low-cost/high-performance radar ideal for the surveillance of military camps, airports, prisons and other locations, with capabilities particularly suited for border surveillance/protection operations in areas with limited lines of sight. 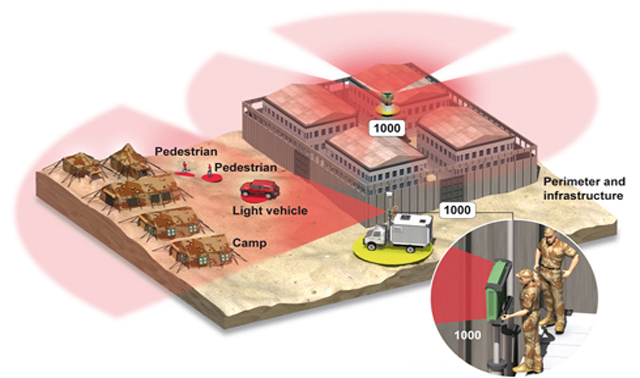 Able to automatically detect and classify ground, sea and low-flying air targets, SPEXER 1000 ensures early warning and an optimal level of situational awareness for large areas over operationally significant distances, thanks to its high update rate of up to 100 degrees in less than two seconds at distances up to 6.8 miles for light vehicles. The SPEXER 1000 benefits from a wide range of operational features due to its incorporation of Digital Beam Forming (DBF) technology – which enables this radar system to observe areas by projecting several instantaneous beams, resulting in higher levels of operational effectiveness compared to other mechanically- or electronically-scanned radars. • Long Range detection mode for early threat detection. SPEXER 1000 features include a low weight and compact size, and it can be deployed as a land-based fixed installed system, integrated in a smart vehicle or as a highly operationally effective man-portable system. In addition, the radar can be integrated with a video-based system for optical recognition and identification of radar contacts. The SPEXER 1000 is an ideal low-cost radar ideally suited for Critical Infrastructure Protection and Border Surveillance/Protection in mid-range security applications, designed for operation in the harshest climatic conditions where other sensors typically fail.